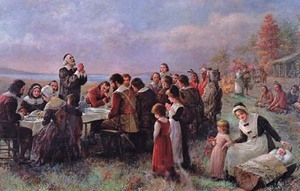 Knowing the Puritans, they were OFFICIALLY giving thanks for being delivered from the Popish Beast of Anglican England. Unofficially, of course, they most likely sending up a big Holla Back to God for putting something on the table that wasn't seaweed or treebark. Captain John Smith: What's that huge thing in the center of the table? Pocahontas: Our people call that a "turkey" oh Rather Cute Man From Across The Sea. Smith: Smells good. What's that red goo next to it? Pocahontas: Another dish of my people, oh Beefcake Of A Different Tribe. We call it "cranberry garnish." Standish (loudly): THE SMELL IS UNIMPORTANT NEXT TO THE BREATH OF FRESH AIR OF LIVING AWAY FROM THE SEDUCTIONS OF THE WHORE OF BABYLON!